Welcome to Sassy Jacks Stitchery! We are super happy you’ve found us! We LOVE Needlework, and we’d love to have you as part of our stitching family. You can use the search bar at the top of the page, or you can pull up your favorite designer or class or other category at the bottom of the page, or you can use the drop down menu to the far right. If you don’t find what you’re looking for on our site, please give us a call at 828-785-4405 or send us an email at sassyjacksstitchery@gmail.com. We are super excited to offer you the full line of Sulky Perle #12 in both solid and blended/variegate d colors. Perle #12 is a great substitute for two ply of floss and has a beautiful sheen. Several designers are offering conversions for it with their new charts, including Hands on Design and Summer House Stitche Workes. Sassafras Samplers will be offering some fabulous Halloween original designs this summer with this gorgeous perle! 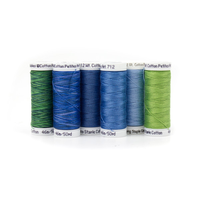 You can buy it individually by the spool or in the set by first and second 80 colors. We’ll soon offer smaller selections as well. I’m so excited about these that we included one in our Jack’s Stash for March! I hope you enjoy. Elizabeth Weston is only one of the four gorgeous new reproduction samplers released at the Nashville Needlework Market in March. She’s simply gorgeous. We’ve offered her kitted with 37ct. Wild Honey Linen from Legacy Linens and the accompanying Soie d’Alger from Au ver a Soie. This is such a beautiful sampler. Take a look at the other new ladies in waiting from Hands Across the Sea Samplers by clicking on the photo. Let us know if we can help you kit her up. We also have some very beautiful higher count linen from Legacy Linen as well. I had a fabulous encounter at Nashville with a really wonderful new to Nashville designer, Stephanie Webb of Lindy Stitches. This beautiful design is only one of the gorgeous beauties from Lindy Stitches. You can check them out by clicking on the picture of my favorite, Birds to the Boughs. Summer House Stitche Workes brought us some wonderful new stitches this Spring. This really great “Liberty & Justice For All”, along with “Sister Suffragette” really resonated with me, and my heart was drawn to the beautiful Eliza Garside 1841 with all its happy flowers. And I really love the new Fragments Series. We’re stitching those all on one sampler piece this year, as well as smalls for a sweet dough bowl. Beth Seal really just brought us a great selection this market. And she introduced a line I’m really excited about called “Modern Organic”. I think lots of folks will love it. They are fun, modern, trendy stitches that can easily be worked on aida or linen, with floss or Perle #12. I’m really excited about these!! Thanks Beth for bringing those to us!! Copyright © 2014 Sassy Jacks Stitchery. All Rights Reserved.